Quite a year for "World Premieres"
We’re here! 2018 is over (mostly) and awards season has begun. We’ll be running our own Game of the Year list later this month but gaming’s faux-Oscars, The Game Awards, took place last night in Los Angeles. Spoiler: God of War took home Game of the Year, which I’ll have to trust them on since it’s not a PC game. But forget awards, right? The real reason everyone watches Geoff Keighley’s event every year is the “World Premieres,” as close as we’ve got to a wintertime press conference. We’ve gone ahead and rounded up the best of the night below, from Obsidian’s Outer Worlds to new Stanley Parable to Mortal Kombat XI, Psychonauts 2, and a fresh Supergiant game. The night started strong with The Stanley Parable: Deluxe Edition. Yes, more Stanley Parable at long last, nearly a decade after the original mod and six years after the standalone release. “And they’ll all buy it again because they’re suckers,” the video says, and it’s not far off. New paths, new endings, and one hilarious trailer. Check it out below. This one leaked early so maybe you already knew, but Ubisoft’s doing the standard Far Cry/Far Cry spinoff cycle. In February we’ll get Far Cry: New Dawn, a post-apocalyptic take on Far Cry ‘s formula. Hopefully it’s a little more interesting than Far Cry 5, but time will tell. Need something to play right now? Bastion and Transistor developer Supergiant is back with a new Greek mythology-inspired game, Hades, which looks a lot like the isometric action I loved in Bastion. And here’s the big news: It’s available immediately in Early Access on the new Epic Games Store. There’s your first exclusive. Go check it out. While we’re talking Epic Games Store exclusives, it’s worth noting that the Epic Games Store website went live during the Game Awards. And the big news there? Journey is coming to the PC, a full six years after its release on the PlayStation 3. Incredible, and I’m so happy to be able to play through that experience again. A bit weird to see Anthem classified as a World Premiere given we’ve seen the game a half-dozen times over already, but a brand new trailer for BioWare’s Destiny-alike debuted during the Game Awards. This one looks, if we’re being honest, even more like Destiny than the last few trailers. And as promised, Dragon Age 4 showed up at the Game Awards despite reports saying it won’t be out until at least 2021. As you’d expect from that sort of announcement, there’s basically nothing in this trailer. But here you go. Here’s the hot take: Crash Team Racing was better than Mario Kart 64. In fact I’d call it the best kart racer ever made. When Activision remastered Crash Bandicoot, I hoped we’d see a Crash Team Racing remaster at some point, and now it’s here. Unfortunately it’s PS4-only at the moment, but I’d expect it to come to PC a year later like the Crash trilogy. 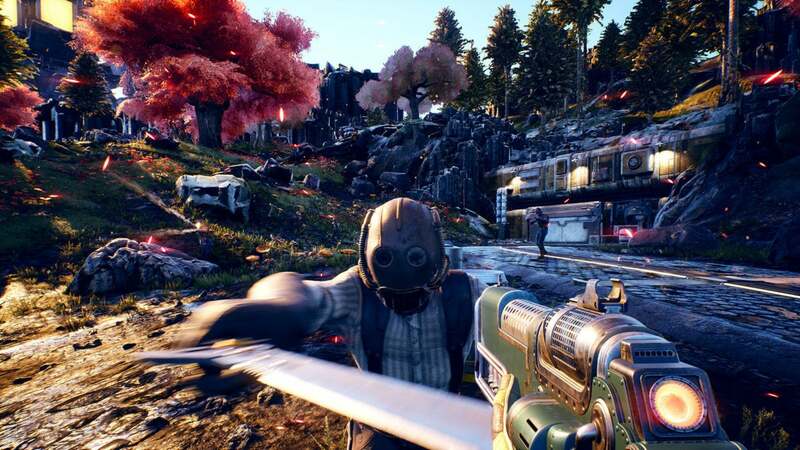 We knew Obsidian was teasing some sort of Fallout-esque game, but Outer Worlds is a lot bigger looking than I was expecting. I thought we’d be seeing another Pillars of Eternity-style isometric experience built on a low budget, but instead we’re getting something that looks a hell of a lot like Fallout: New Vegas crossed with uh...maybe Borderlands? It’s hard to tell how much of this is RPG and how much is shooter, but I can’t wait to find out more. It looks great, and it’s been a while since Obsidian’s gotten to make something this ambitious. Outer Worlds looks a little like No Man’s Sky, which I bring up only because Hello Games followed with its own World Premiere. Looks like the studio’s had time to work on a very different sort of game while fixing up No Man’s Sky. The Last Campfire looks...sweet. Not sure what you do in it yet, but yeah, looks sweet. I guess everyone saw Sea of Thieves and was like “Wow, we should do that,” because the ARK: Survival Evolved developer Studio Wildcard is making something that looks suspiciously like Rare’s pirate game, with some additional survival mechanics and huge monsters. Check out the trailer below, and I guess we’ll see if Atlas can avoid the content drought problems that plagues Sea of Thieves. Speaking of Journey, the team who made the vaguely reminiscent underwater adventure Abzu are back with another very pretty game called The Pathless. I didn’t expect Human Head to be back with another game so soon after performance art piece The Quiet Man, but Survived By launched on Steam Early Access this week and got a shout-out during the Game Awards. It looks sort-of like a top-down version of Rogue Legacy, though I haven’t touched it yet. Hey, Netherrealm is making another Mortal Kombat. Surprise! I’d like to say more, but honestly there’s just a CG fight between Raiden and Scorpion and that’s about it. Hey, we got a Psychonauts 2 launch date! In 2019 we’ll see the long-awaited sequel, a full 14 years after the original. The locations here look just as creative as I hoped, and I’ve got high hopes for this one. Also the logo looks great. No more Andrew W.K. in this new Rage 2 trailer, but otherwise it looks much the same as it did at E3: Great id shooting, great Avalanche driving, and a lot of Borderlands influence. After the bland mess of the first Rage, it’s weird to say but...I think Rage 2 might be one of my most anticipated releases for 2019. Speaking of which, Bethesda slapped a May release date on it as well. And that’s it! Lots of interesting stuff for 2019, as the schedule starts to fill out. Congratulations to God of War as well, and Geoff Keighley for hosting a pretty solid E3 press conference awards show as always.